On August 10, 2016, the SEC brought a case against a public company for using severance agreements that violated SEC whistleblower protections by: (1) requiring departing employees to waive their SEC whistleblower award rights, and (2) impeding their ability to report securities law violations through the SEC whistleblower program. The company, BlueLinx Holdings, Inc. (“BlueLinx”), had approximately 1,700 employees. … Employee understands and agrees that Employee is waiving the right to any monetary recovery in connection with any such complaint or charge that Employee may file with an administrative agency. In its Order, the Commission specifically underlined the above language. According to the Order, approximately 160 BlueLinx employees signed severance agreements requiring them to waive their SEC whistleblower award rights. … by requiring its departing employees to forgo any monetary recovery in connection with providing information to the Commission, BlueLinx removed the critically important financial incentives that are intended to encourage persons to communicate directly with Commission staff about possible securities law violations. In a press release, the then-Chief (and later Chief) of the SEC’s Office of the Whistleblower was emphatic that “Companies simply cannot undercut a key tenet of our whistleblower program by requiring employees to forego potential whistleblower awards in order to receive their severance payments”. In addition to the waiver of SEC whistleblower award rights, BlueLinx’s various severance agreements contained confidentiality provisions. Other BlueLinx agreements barred departing employees from communicating or divulging “confidential information” for two years “without the prior written consent of the Company or as may otherwise be required by law or legal process”. BlueLinx later amended yet another one of its agreements to require that “in the event disclosure is required by law, you shall provide the Company’s Legal Department with prompt written notice of such requirement … prior to any such disclosure by you”. By requiring departing employees to notify the company’s Legal Department prior to disclosing any financial or business information to third parties without expressly exempting the Commission from the scope of this restriction, BlueLinx forced those employees to choose between identifying themselves to the company as whistleblowers or potentially losing their severance pay and benefits. 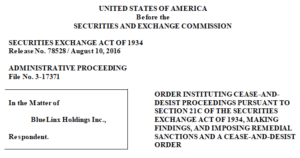 The SEC found that BlueLinx’s “[r]estrictions on the ability of employees to share confidential corporate information regarding possible securities law violations with the Commission and to accept financial awards for providing information to the Commission” violated SEC whistleblower rule 21F-17(a) and undermined the purpose of the SEC whistleblower program. Employee understands that nothing contained in this Agreement limits Employee’s ability to file a charge or complaint with … the Securities and Exchange Commission … Employee further understands that this Agreement does not limit Employee’s ability to communicate with any Government Agencies or otherwise participate in any investigation or proceeding that may be conducted by any Government Agency, including providing documents or other information, without notice to the Company. This agreement does not limit Employee’s right to receive an award for information provided to Government Agencies. In addition, the Order required BlueLinx to provide employees who had signed the violative severance agreements with an Internet link to the Order. BlueLinx also had to give them a statement that it does not prohibit employees from communicating with or providing information to the SEC without notice to the company, and does not prohibit them from exercising their SEC whistleblower award rights and accepting SEC whistleblower awards. In the SEC’s press release, the Deputy Director of its Enforcement Division asserted that the SEC is “continuing to stand up for whistleblowers and clear away impediments that may chill them from coming forward with information about potential securities law violations”.